Danny and Kaylor Cruz have made 14 consecutive trips to the College World Series. OMAHA, Neb. -- As Danny Cruz roamed what remains of Rosenblatt Stadium with his son Kaylor, he compared the view of the glass dome just beyond the right field foul pole, to cell-phone photos he had of a view from another time, obstructed by what used to be right-field seats. The dome, an enclosure that bares resemblance to Spaceship Earth in Disney’s Epcot Center, serves as host of the desert exhibit in the neighboring Omaha Zoo. Johnny Rosenblatt Stadium served as CWS host through 2010 prior to its move to TD Ameritrade Park. Most of the stadium is now a parking lot for Omaha's Henry Doorly Zoo, but the magic of the stadium isn't lost. While he snapped new pictures of the dome’s current view, Danny remembered the first Father’s Day he spent with his son in Omaha for the College World Series. "14 years now with my son," Danny said. "It’s a father’s day weekend tradition. We come fishing, golfing, hit three or four games, do what we can, go to the zoo every year, it’s a great time, great atmosphere." Fans of the Longhorns from Galveston, Texas, an orange-clad Danny, 48, and Kaylor, 17, visited the site of their first College World Series experiences for the first time since the series moved to TD Ameritrade Park, roughly three miles on the other side of town in 2011. Danny and a then-3 year-old Kaylor got to see Augie Garrido win the last of his five CWS titles in their first trip to Omaha, and say the memories have piled high in their 14 trips. “We’re huge Longhorn fans, but we had such a great time, we came every year, regardless of who was playing,” Danny said. “I remember one year we came and it was kind of crazy because it was both LSU and Texas weren’t here which was odd. The tradition became so special to Danny and Kaylor, that they brought memories of their time in Omaha home with them. Danny had a photo of the Road to Omaha sculpture -- that now sits outside TD Ameritrade Park after years residing as a greeting in front of Rosenblatt -- printed onto a customized credit card. Danny got Kaylor a red seat from the stands of the originial Rosenblatt Stadium as a Christmas gift. 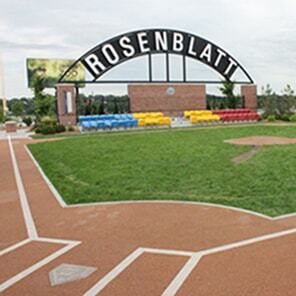 Kaylor received a seat from the old Rosenblatt Stadium as a Christmas gift from his father. Although Rosenblatt serves as a special place for Danny and Kaylor, Danny appreciates the new park’s ability to keep the spirit of the CWS. Although they've made countless memories in their trip to Omaha, Danny Cruz said there's still something at the top of their list that has eluded them for 14 years. "We’re still hoping to catch our first foul ball though."